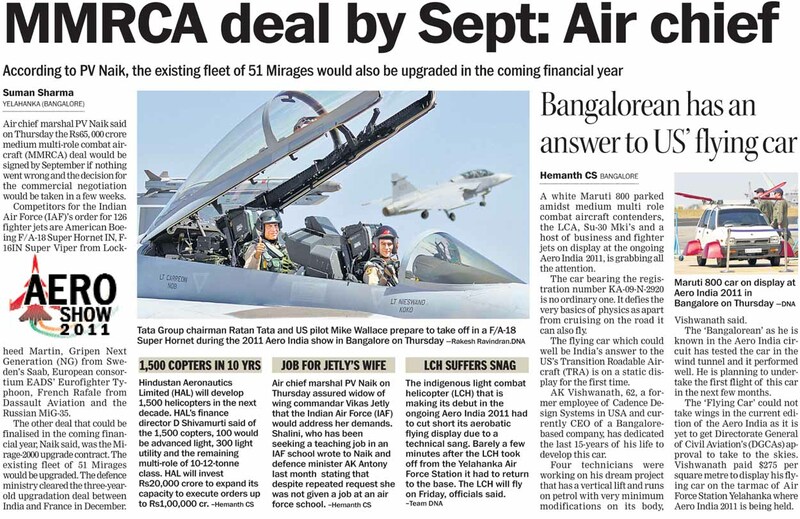 Ajay Banerjee/TNS Bangalore, February 10 Inching closer towards the finalisation of the biggest ever fighter aircraft deal worth Rs 49,000 crore ($11 billion), the Indian Air Force today said that negotiations with the six contenders would begin within a month from now. Industrialist Ratan Tata gets into a US F-18 aircraft for a sortie during the ongoing Aero India show at Yelahanka air base in Bangalore on Thursday. Industrialist Ratan Tata gets into a US F-18 aircraft for a sortie during the ongoing Aero India show at Yelahanka air base in Bangalore on Thursday. 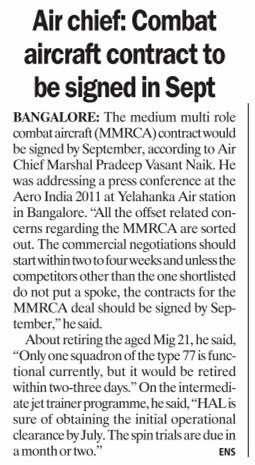 Tribune photo: Manas Ranjan Bhui Addressing mediapersons at Yelahanka air base here, Air Chief Marshall PV Naik said that if all went well, he expected the deal by September. The deadline, however, may not be met in case some firm losing the bid “put spokes in the wheel”, he said. 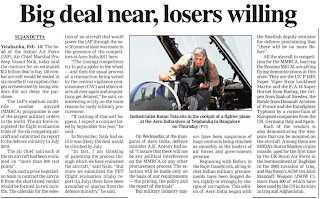 In that event, said the IAF Chief, they might have to tread a lengthy course. 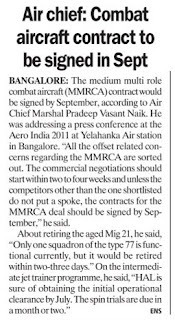 It was only yesterday that Defence Minister AK Antony had given a broad time frame saying he expected the deal -- 126 medium multi-role combat aircraft (MMRCA) are to be bought -- by the next fiscal. 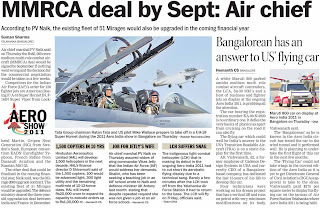 American aerospace majors Boeing and Lockheed Martin, Russian MiG-RAC, Swedish Saab, French Dassault and European consortium EADS are in race for the deal, tenders for which were issued in August 2007. The IAF completed flight and weapon evaluation of the six contending aircraft -- F-16, F/A-18, MiG-35, Gripen, Rafale and Eurofighter Typoon -- in July last and submitted its report to the Ministry of Defence, which is studying the capabilities of all the planes. Even as the IAF announced its timeline, the pilots of the contending fighter aircraft today displayed the abilities of their machines while flying over the air base in deafening roars. 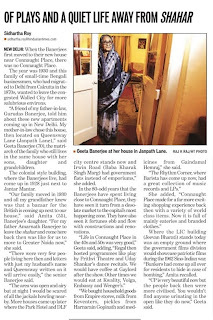 In the marquee chalets of the companies, serious offers were made to India. The chairman of the Supervisory Board of Eurofighter, Bernhard Gerwert, said, “We want India to be part of the EADS family. We are ready to offer a revenue-sharing partnership and also industrial development.” The UK, Germany, Spain and Italy are partners in the EADS consortium. The UK’s Minister of Defence Equipment Support and Technology Peter Luff told The Tribune, “We will offer the most generous technology transfer as compared to our competitors.” Guido Crosetto, Secretary of Defence, Italy; Karl-Theodor zu Guttenberg, Defence Minister of Germany and Costantino Mendez, Secretary of State for Defence, Spain, were present at the aero show today. Boeing F-18-A Vice President Kory Matthews clarified that his company would be able to provide top-end technology even if India did not sign the Communication Interoperability and Security Memorandum of Agreement (CISMOA). Some new equipment can be incorporated even though the baseline offer was in line if the CISMOA was signed, his team members said in response to a question whether Boeing would be able to provide top-end equipment as the US laws did not permit the transfer of technology to countries that do not sign such agreements. Ajay Banerjee/TNS Bangalore, February 10 A new bigger and more powerful chopper has been pressed into service specifically for the needs of the Army in Siachen. The chopper, an upgraded version of the existing Dhruv, will have a brand new engine enabling it to carry heavier loads to drop supplies at the glacier in the harsh winter months and ensure safer evacuation of those needing medical treatment. The glacier (21,000 feet) in northern Jammu and Kashmir has been a flashpoint between India and Pakistan since 1984. The Army has a brigade-level (5,000 troops) deployment at the glacier. The daily supplies have to be dropped by choppers based at Leh. At present, the vintage Cheetah/ Cheetak choppers operate there and barely meet the requirements in case of emergency evacuation. The feet of the soldier, when evacuated in a lying down position, stick out as the chopper is not wide enough. The first of the five new choppers, named Dhruv Mark III, were handed over by Hindustan Aeronautics Limited to the Army Aviation Wing today. P Soundara Rajan, Director Corporate planning, HAL, confirmed that the engine - Shakti - is powerful enough to take the chopper to Siachen and even higher. The HAL and French company Turbomeca have co-developed the engine and one of the key specifications was the ability to land and take off at a high altitude. The earlier version of the Dhruv did not have the ability and the Army was using the souped up version of Cheetah/Chetak for its Siachen operations. The HAL will produce 159 of these choppers. Separately, Indian Air Force Chief Air Chief Marshall PV Naik, listed how the IAF’s chopper fleet is going to change and the present year will be important. The evaluation report of attack choppers is expected in a week. Russian-origin Mi- 28 and Boeing’s Apache are in the race. The IAF is looking to add another 50 of the medium lift Mi-17-V choppers in addition to the 80 that are expected this year. In case of the heavy-lift choppers, the Russian Mi-26 and Boeing’s Chinook are in the race. The last bit of the flight evaluation test is over, the IAF chief said. The 12 of the Agusta Westland choppers for VVIP use were expected shortly. Lastly, the trials for the 197 light utility choppers are over and the evaluation report was expected shortly, Air Chief Marshall Naik added. At least 27 troops have been killed and more than 40 others sustained injuries when a young suicide bomber in a school uniform attacked soldiers during morning exercises at army training camp at northwestern Pakistani town of Mardan Thursday morning. AT LEAST 27 troops have been killed and more than 40 others sustained injuries when a young suicide bomber in a school uniform attacked soldiers during morning exercises at army training camp at northwestern Pakistani town of Mardan Thursday morning. Police officials say it was one of the worst attacks on security forces in recent months which struck at 0800 local time. Prime Minister Yousuf Raza Gilani condemned the attack on the Punjab Regiment Centre. In a statement the prime minister said, “Such cowardly attacks cannot affect the morale of the security agencies and the resolve of the nation to eradicate terrorism.” The Punjab Regiment is one of Pakistan's most famous military units. Talking to APTN senior police official Abdullah Khan said 27 soldiers died and around 40 were wounded, some critically. Khan said an examination of the body parts at the scene indicated the bomber was a teenage boy, which is a common finding in suicide bombings in Pakistan. Reports say troops quickly cordoned off the area and even police had a difficult time getting through. BBC writes that speaking to a news agency from an undisclosed location, Taliban spokesman Azam Tariq said the organisation claimed Thursday's attack "with pride" to avenge people killed by US drone attacks and by military operations in the tribal areas. The Taliban, he said, would continue to carry out attacks on "those who protect the Americans." Sabyasachi Bandopadhyay Posted online: Fri Feb 11 2011, 03:24 hrs Kolkata : The state government today refused to order a CBI inquiry into the incident of violence and the subsequent police firing at Sipchu at Jalpaiguri on February 8 that saw two Gorkha Janmukti Morcha (GJM) supporters killed. The Morcha, spearheading for a separate Gorkhaland, as well as Darjeeling BJP MP Jaswant Singh have demanded a CBI probe into the incident. What is intriguing is the state government was not ready to order even a CID inquiry into the incident as is usually done in this kind of violence. 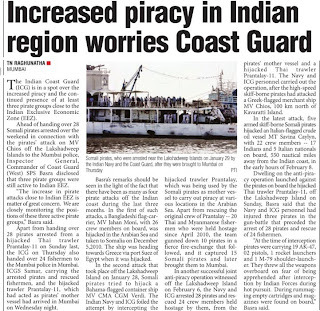 “A magisterial inquiry has been started and we think that was enough to unearth the truth,” state Home Secretary G D Gautama today told The Indian Express. And even though Union Defence Minister A K Antony yesterday categorically said at a press conference in Bangalore that the state government has withdrawn its request for Army deployment at the trouble-torn areas that it had earlier made, Gautama said no such thing has happened. “I cannot comment on the Defence Minister’s words but I can swear the state government has not withdrawn its request for army deployment. The request is still pending with the Defence ministry. The fact is we asked for Army assistance but we did not get it. 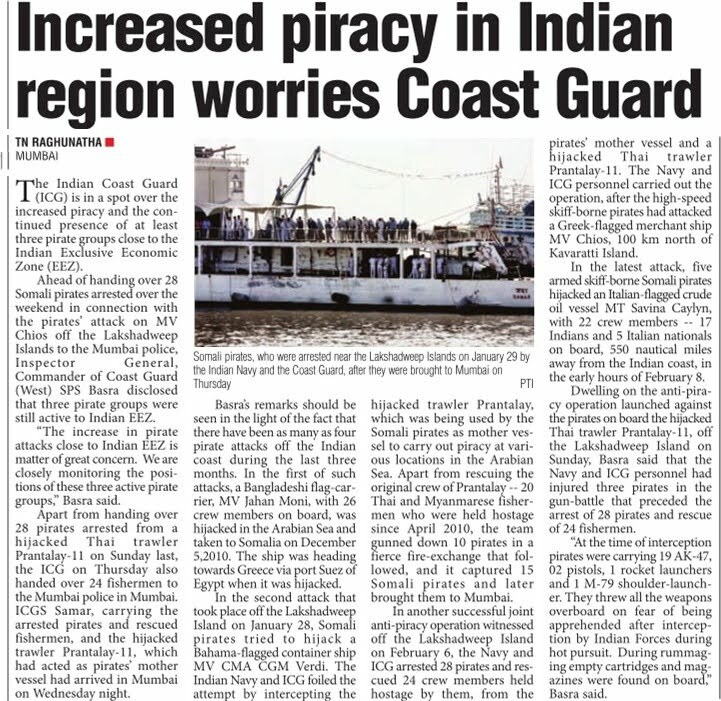 The state government will be too happy even now if it gets Army help because that can be used for confidence-building measures,” the Home Secretary further said. Meanwhile even as the indefinite bandh called by the GJM entered the second day in Darjeeling and Dooars, the GJM today took out a huge rally at Sipchu and Kalimpong with the bodies of the two GJM supporters killed in police firing on February 8. “Our agitation will go on till our final goal for Gorkhaland is achieved. We will decide about the bandh at tomorrow’s meeting of our central committee,” Harka Bahadur Chhetry, Morcha spokesman, told The Indian Express over phone. 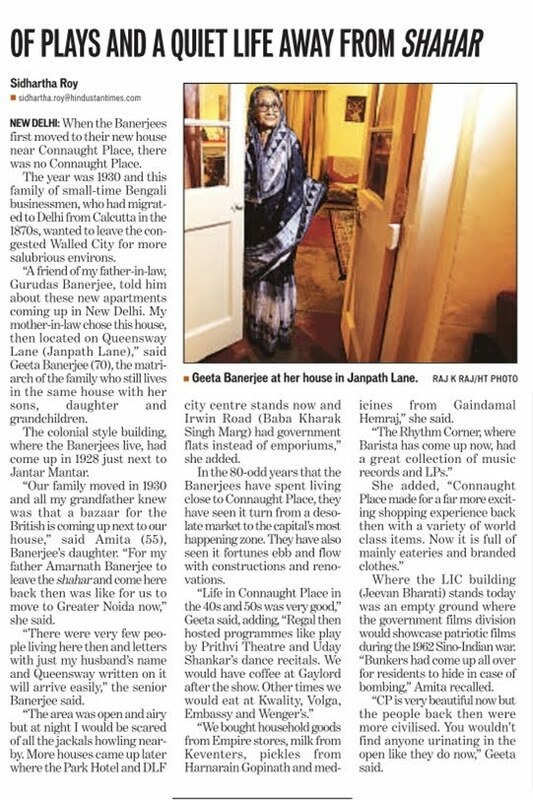 He also said MP Jaswant Singh would come to Darjeeling in a day or two. “He is in regular touch with us and is giving us support,” Chhetry said. Mahesh Kulkarni / Chennai/ Bangalore February 11, 2011, 0:01 IST Bharat Electronics Limited (BEL), the Bangalore-based public sector defence electronics company, is actively looking at a possibility of collaborating with an overseas company to set up a manufacturing plant to produce seekers for missiles in the country, a top company official said. “Our core competence is in the defence electronics segment and we are looking at increasing our business in this area. As part of this strategy we are looking at new business opportunities and that include making seekers for missiles. We are in talks with a world leader for setting up a facility to jointly manufacture seekers in India,” Ashwani Kumar Datt, chairman and managing director, BEL said. 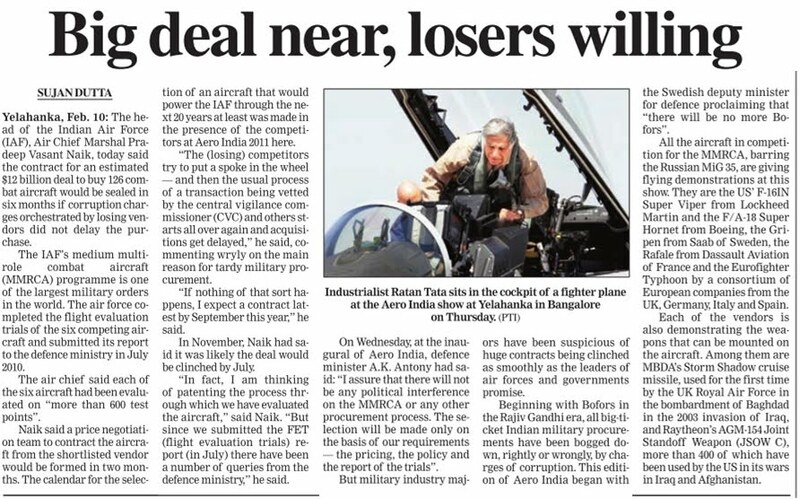 Talking to Business Standard on the sidelines of Aero India 2011, he said the country is currently dependent on imports for seekers for its missile programme and it cannot depend too much on the imports. “We need to achieve self sufficiency in seekers as it is a critical component in a missile programme. Presently, BEL does not require seekers for its Akash Weapon System, but there are other missiles that need seekers and we want to produce them locally,” he said. The company wants to manufacture seekers and supply to other public sector missile maker, Bharat Dynamics Limited (BDL). The investment required for setting up a new manufacturing plant for seekers could range between Rs 300 crore to Rs 500 crore and BEL has enough cash to support its plan, he said and added that currently BEL has a cash reserve in the range of Rs 3,500 crore. As regards Akash Weapon System order from the Indian Army, Datt said the company expects to get substantial business from the Army, while the system will be integrated by BDL.He said the company hopes to get an order worth around Rs 500 crore from the Indian Coast Guard for Coastal Surveillance System by end of March this year. Datt said the company is in final stages of talks with Thales of France for forming a joint venture for both civilian and defence applications. The company is already working with Thales on many programmes successfully, he added. In addition to this, BEL is also in talks with Rafael of Israel for forming another joint venture for missile seekers and guidance electronics. BEL, which reported a turnover of Rs 5,220 crore in 2009-10, is looking at a growth of 10 per cent to achieve a turnover of over Rs 5,700 crore during 2010-11. The company’s current order book position stands at Rs 16,742 crore. 2011-02-10 17:20:00 Vista 90 is Here Ads by Google The Most Powerful Petrol Hatch in its Class.Blink it & You'll Miss it Cars.tatamotors.com/Vista90 New Delhi, Feb 10 (IANS) Pakistan's nuclear weapons were well protected through the dispersal of various components and chances that terrorists would get their hands on one were remote, an Indian official said Thursday. Pakistan has not maintained its atomic assets at one place and components of nuclear weapons in that country are dispersed, making it impossible for terrorists to obtain the arsenal, according to Joint Secretary S.K. Gupta, who is currently in the National Security Council (NSC) of India. 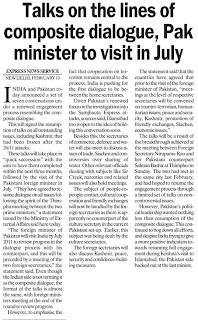 NSC, headed by the national security advisor to the prime minister, is the apex body looking into the political, economic, energy and strategic security concerns of India. Gupta was speaking on 'Pakistan's Nuclear programme' - a lecture organised by the Indian Pugwash Society at the Institute of Defence and Strategic Analyses here. 'Pakistan's nuclear weapons are so well protected. It is not easy for a person to enter (nuclear complexes),' Gupta said. He said Pakistan has dispersed its nuclear complexes at different places. 'They are being watched, they are under surveillance every time,' he said. The official said Pakistan's nuclear programme was essentially under the army of that country and 'the Pakistan army is well trained and they cannot take chances'. 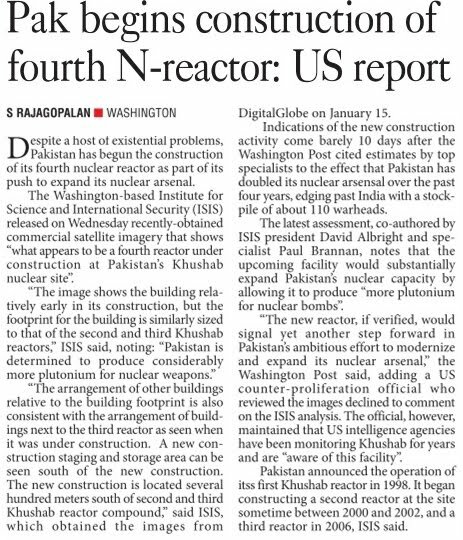 They have a well-planned structure created for managing nuclear assets, he said. 'The total number of structure groups is eight. Their roles are established, their locations are established.' Asked if keeping the components of nuclear weapons at a distance from each other would be a disadvantage in case of an emergency, Gupta said Pakistan had proven through drills its ability to assemble and deploy the arsenal in just three hours. 'It is a matter of time for Pakistan to assemble nuclear devices, missiles at a short notice of time. Earlier they would take six hours but now they take only three hours from storage to deployment,' he said. 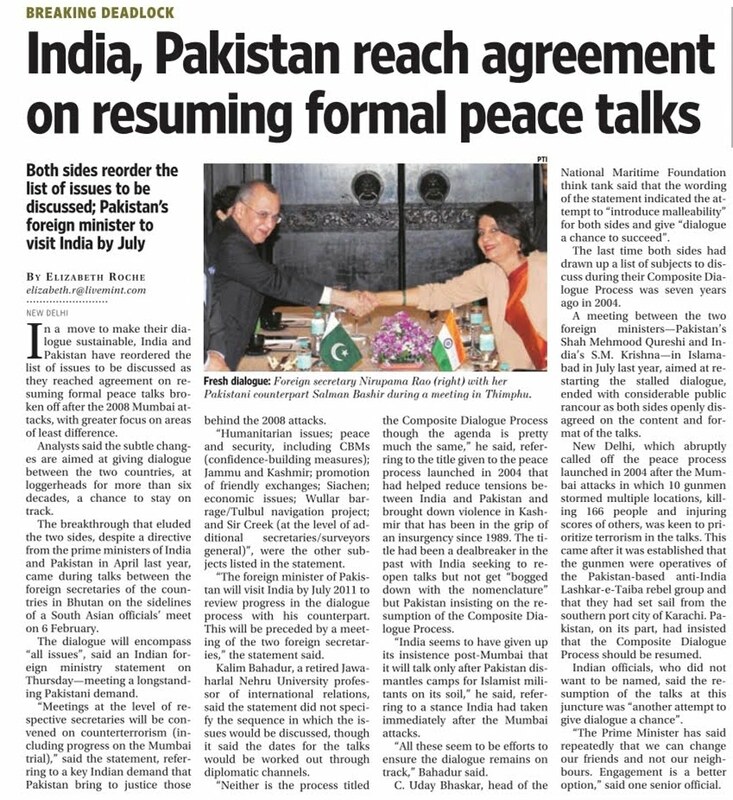 The remarks from the Indian official come days after it was revealed that Pakistan had doubled its nuclear weapons' inventory in the past decade stockpile to over 100, causing worries in the global community. 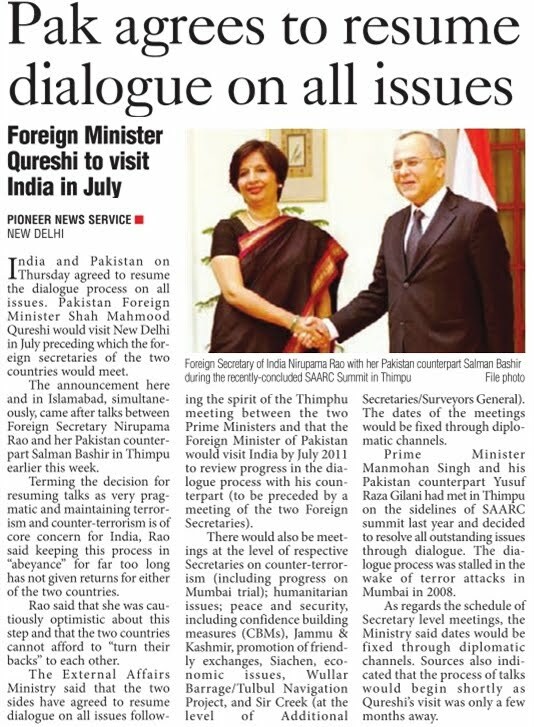 Gupta said he was speaking on the basis of inputs and imagery India had acquired independently. 'Over the years we have got our own technical inputs. We never relied on the US (for such inputs),' he said. 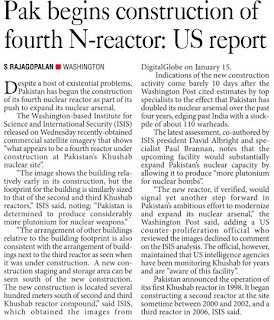 There have been concerns that Islamist militant groups, including the Al Qaeda, have been attempting to steal nuclear material from Pakistan's reactor and recruit scientists to build a 'dirty bomb'. But Gupta ruled it out saying an insider may try to do so. 'That possibility cannot be ruled out but that is also remote. They (nuclear assets) are well protected by codes. Anyway, it is not even going to act as a dirty bomb.' Gupta, however, said that the Pakistan's nuclear programme was essentially an extension of Chinese as Beijing has been helping Islamabad to build atomic weapons. 'Pakistan's nuclear programme is not independent. In each and every field they are getting Chinese assistance,' he said, adding the country was also diverting foreign for financial backing of nuclear reactors. 'Diversion (of foreign aid) is definitely there. The financial backing also comes from countries especially from Saudi Arabia,' he said. 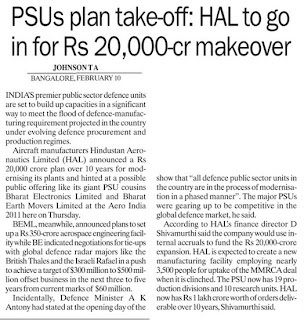 India's defence behemoth Hindustan Aeronautics Ltd (HAL) is awaiting the government's green signal to go public soon to raise funds and improve its corporate governance, an official said Thursday. 'Being a fully owned state-run enterprise, it is for the government to decide when to begin the disinvestment process and the quantum of dilution,' HAL finance director D. Shivamurti told reporters. 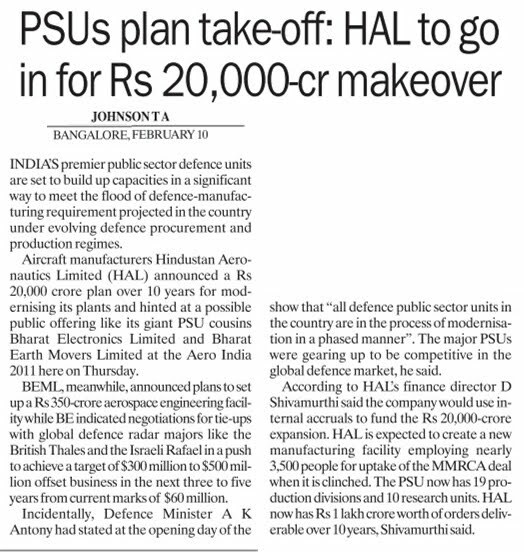 Though other city-based state-run defence firms such as Bharat Electronics Ltd (BEL) and Bharat Earth Movers Ltd (BEML) had gone public long ago, the government had been wary of diluting its 100 percent equity holding in the strategic HAL, a sole manufacturer of military aircraft and aerospace systems for the Indian armed forces. 'The process of making an initial public offer (IPO) is on for various reasons, including meeting corporate governance objectives, making public stakeholders and have financial muscle to meet our future requirements for scaling our strategic operations,' Shivamurti said on the sidelines of Aero India 2011 trade expo here. Once the government approves divesting in the open market, the 70-year old company board will decide the quantum, value and the timing of the issue. 'We will be investing about Rs.20,000 crore (Rs.200 billion) over the next 10 years to modernise and expand our capacity to execute orders valued at Rs.100,000 crore (Rs.1 trillion). We plan to raise funds internally (about Rs.1,500 crore) and from the market through a combination of equity and debt instruments than depend on the government for capital investments,' Shivamurti said. As a global player in the aerospace industry, the Rs.11,500-crore HAL makes various types of fixed wing aircraft under licensed production, rotary wing choppers and sub-systems primarily for the Indian Air Force (IAF), army and navy and Coast Guard. 'Though we have about Rs.9,000 crore in reserves and excellent credit rating to borrow in the debt market, we feel it's time to tap the public for raising additional funds to meet our present and future investment requirements,' Shivamurti added. The company has projected a turnover of Rs.12,600 crore for this fiscal (2010-11). India clueless on defence ties with China? 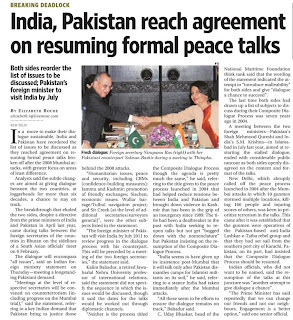 Express News Service First Published : 10 Feb 2011 03:17:54 AM IST Last Updated : 10 Feb 2011 08:01:21 AM IST BANGALORE: India appears to be clueless on how to take defence ties with Beijing forward. China was not among those invited to attend Aero India 2011 but later India changed its stance. Chinese envoy Xang Yang showed up at the event after getting an invite at the last moment. Defence Minister A K Antony on Friday said China was not invited becauseit had never taken interest in the event before. But this time, the Chinese ambassador did not miss the opportunity to make his presence felt even when the invitation to him was delivered only yesterday afternoon. Complemented He not only met Antony at the show inaugural but also complimented that the arrangements were impressive. But all was not well for theChinese journalists. At the defence minister's press conference, representative of China's Central News Agency Meau Li claimed she had a harrowing time get entry into the event. Antony took notice of her complaint and ordered that she should be allowed to cover the entire show ending on February 13. India had earlier overlooked China when it invited friendly countries for the show, one of the biggest aviation events in this part of the world. SinoIndian defence ties were suspended after China had denied visa to India's northern army commander lieutenant general B S Jaswal. 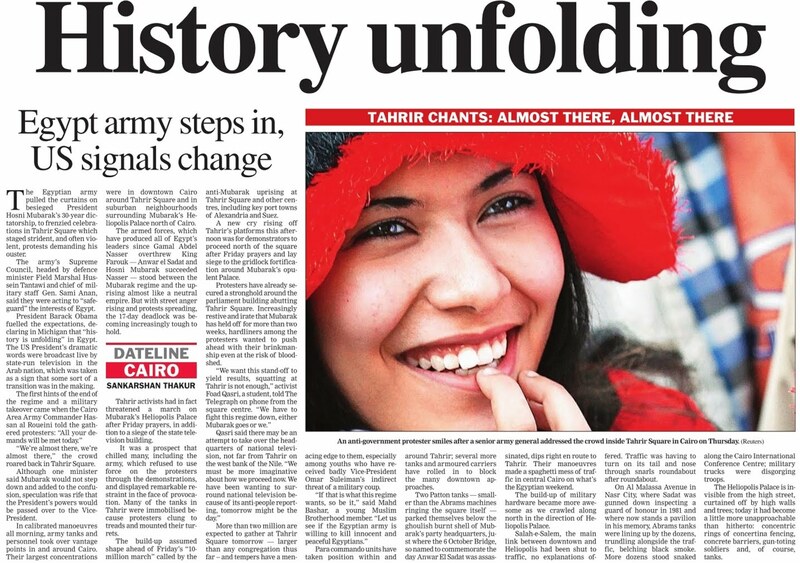 All the military exchanges were put on hold. 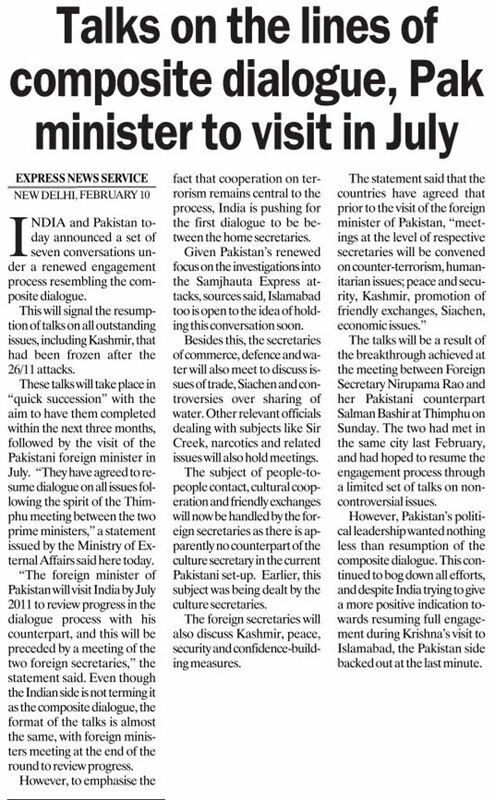 The MoD had passed the buck claiming countries were invited on the advice of ministry of external affairs.